mark Stewart, Suncan Scott, Mark Szaranek, Stephen Milne and Darren Burnett all earned medals for Team Scotland on Sunday. 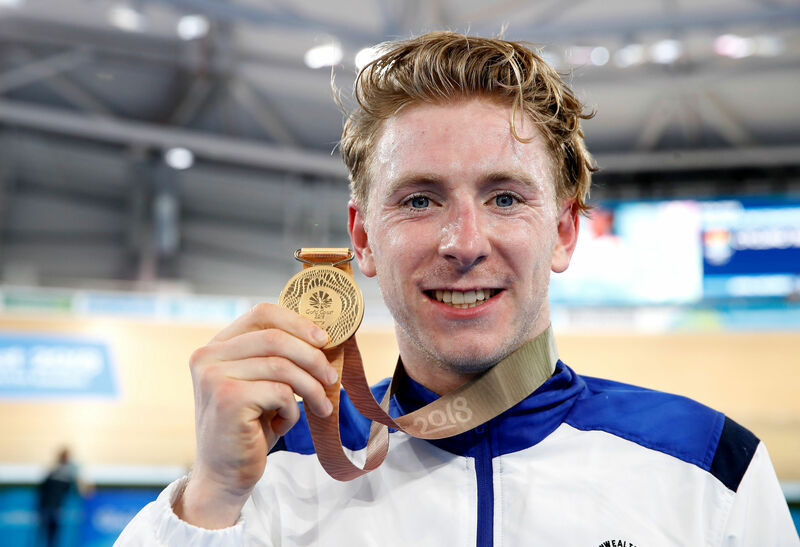 Dundee’s Mark Stewart won Commonwealth gold for Scotland in the men’s points race as the curtain came down on the track cycling events in Brisbane. Stewart gained three laps on the field in the first half of the race to build a strong lead he kept to the end, finishing on 81 points. That put him 12 clear of New Zealand’s Campbell Stewart in second, while England’s Ethan Hayter was one point further back to take bronze. It came on a sensational day for athletes hailing from Tayside and Fife, with three locals earning gold medals. “I’m really proud,” said Stewart. “That was a lot of hard work and it’s come together nicely. “I’m only 22 but I feel like I’ve been at this ages. There’s been a lot of good days and a lot of bad days. This is up there with the good days. Five-time world champion Cameron Meyer had started favourite – the Australian usually does in any points race – but had to settle for fourth place as Stewart’s aggressive strategy paid off. “I think when you ride against someone like Cam Meyer you can’t play his game,” Stewart added. Stewart produced the cycling highlight of the Games on the Gold Coast in the velodrome, according to sporting legend Sir Chris Hoy. 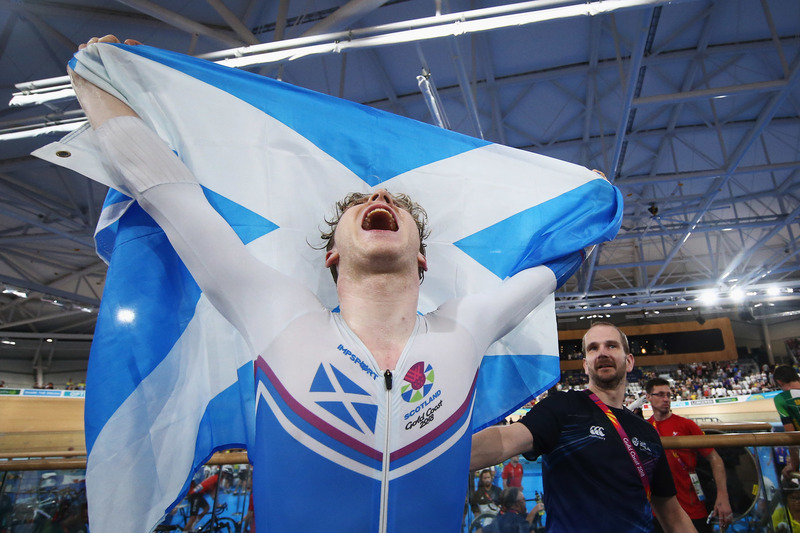 Fellow Scot Neah Evans had earlier taken her second medal of the Games, winning silver in the women’s scratch race, while there was a bronze for Callum Skinner in the 1,000m time trial. Katie Archibald might have been the Scot most were watching in the scratch race, but she would come home fourth as Evans was second to Australian Amy Cure, with England’s Emily Kay collecting bronze. It was a second medal in as many days for Evans, who took bronze in Saturday’s points race. Skinner’s bronze came in a kilo event won by Australian Matthew Glaetzer, who made up for Saturday’s shock early elimination in the sprint by taking gold in a Commonwealth Games record time of 59.340 seconds. New Zealand’s Ed Dawkins also went inside a minute to take silver while Skinner recorded a time of 1:01.083, having shaken off the illness which kept him out of Saturday’s sprint. 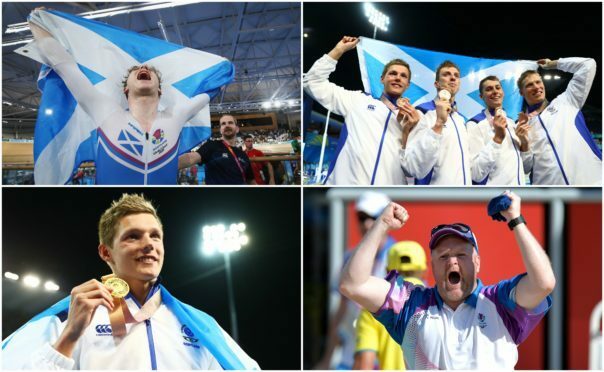 Yesterday’s trio of wins left Scotland with 10 medals in all on the track, four of them gold. Scotland’s Duncan Scott won a stunning Commonwealth Games gold medal in the men’s 100 metres freestyle at the Commonwealth Games. The 20-year-old Stirling swimmer, a former Strathallan pupil, surged down the second length to touch the wall first and take gold in a star-studded field. Scott, who had already won three bronze medals at the Games, clocked 48.02 seconds as South Africa’s Chad le Clos and Australia’s Kyle Chalmers finished in a tie for silver. 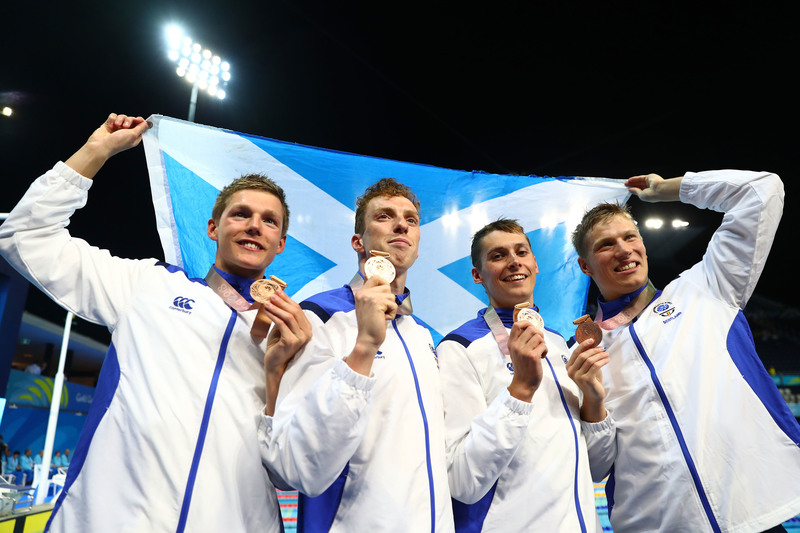 Scott, who later helped Scotland to bronze along with Perth’s Stephen Milne and Fife’s Mark Szaranek in the men’s 4x200m freestyle relay, said: “I’m sort of speechless, and that doesn’t happen often. The main thing there was just executing my own race. “I had to stick to what I’m good at –that’s bringing it home. I had to stay quite composed and let Chad go out and try to hunt him down. I’m really pleased with how I executed. “It didn’t matter who you put in that pool, I’m Commonwealth champion,” said Scott, who has two more medal opportunities to try to build on a record haul for a Scottish athlete at a single Games. Scott’s relay split time was the fastest of the race but the Scots were well beaten by Australia and Szaranek was passed by England’s James Guy in the last leg to miss out on silver. The relay win continued Australia’s dominance of the pool programme, with five gold medals from the eight events on day four. Scotland’s Hannah Miley had to settle for sixth in the 200m individual medley final with a time of 2:13.29. England’s Siobhan O’Connor was dominant in winning the women’s 200m individual medley. After claiming six medals at Glasgow 2014, including 200m individual medley gold, O’Connor streamlined her programme this time and seized her one individual opportunity. The 22-year-old Bath swimmer finished in two minutes 09.80 seconds, while England’s Aimee Willmott, the 400m individual medley gold medallist, was fourth. 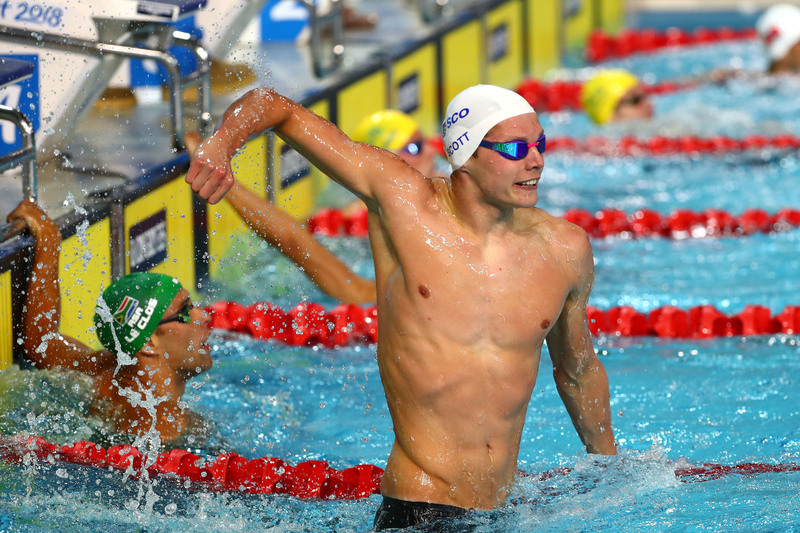 Adam Peaty advanced to the men’s 50m breaststroke final in a Games record of 26.49. The 23-year-old defended his 100m title on Saturday, completing a four-year unbeaten sequence in the event, and is seeking to win a first Commonwealth 50m title. South Africa’s Cameron van der Burgh is likely to be Peaty’s nearest challenger. 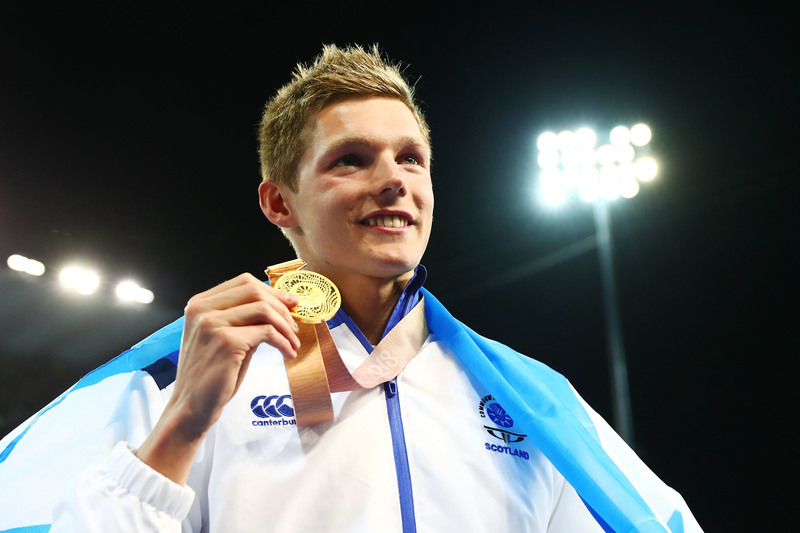 The Glasgow 2014 gold medallist clocked 26.95 in his semi-final. Peaty said: I’m not bothered about the race tomorrow. I’m bothered about enjoying it. If it’s a silver, it’s a silver. If it’s a gold, it’s gold. I’m changing my mentality now. 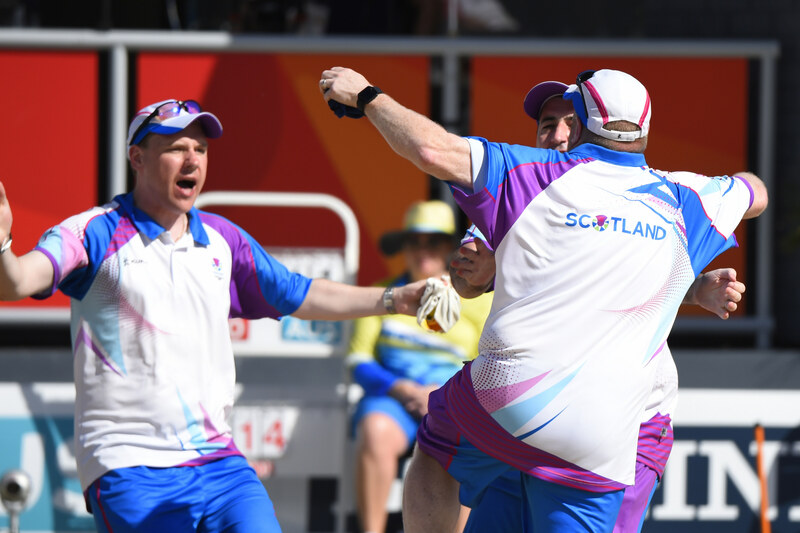 Arbroath’s Darren Burnett held his nerve to steer Scotland to a 19-14 win over Australia in the men’s triples gold medal match at the Broadbeach Bowls Club. Scotland were trailing when Burnett delivered two crucial drives in the 17th and penultimate end to secure a 16-14 lead. Burnett, lead Ronald Duncan and second Derek Oliver claimed another three shots on the final end to clinch a 19-14 victory against the hosts. “It’s the greatest feeling in the world to win the gold medal at the Commonwealth Games. We beat the Aussies in their backyard,” he said. It is the Angus police officer’s second Commonwealth gold, after his singles triumph in Glasgow four years ago. And he will now hope to add another in the singles this time around. Reigning champions Paul Foster and Alex Marshall will defend their crown in the bowls pairs against Marc Wyatt and Daniel Salmon of Wales in today’s final. Montrose boxer John Docherty comfortably progressed to the middleweight quarter-finals with a second unanimous points win, this time against Cypriot Andreas Kokkinos. Docherty’s next fight is against England’s Ben Whittaker on Wednesday. Gymnast Daniel Purvis stepped onto the podium for the second time at this year’s games when his performance on the men’s floor was good enough to claim bronze. The Olympic bronze medallist, 27, scored 13.733 as he added to his bronze in Thursday’s team final. He was unable to add another medal in the men’s rings final, having to settle for seventh place. Team-mate Hamish Carter came fourth in the men’s floor final, following on from his sixth-place finish in the individual all-around. Mark Dry landed Scotland’s first athletics medal of the Games when he took bronze in the men’s hammer behind England’s Nick Miller and Australia’s Matthew Denny, a repeat of his Glasgow 2014 success. “I don’t know what just happened. I barely remember any of it. This journey has been unbelievable,” said Dry. Scotland’s men suffered a 6-1 hockey defeat to Australia, the No 1 ranked team in the Games. Following a gutsy performance which earned them a draw with Canada, Scotland’s women should be confident of claiming full points from today’s penultimate pool B contest against Ghana. They currently sit in fourth place, but with Australia’s Hockeyroos still to be faced and other results conspiring against them, it may be too little too late for the Tartan Hearts to hit their target of a top six finish. All eyes will be on the last game of the day as free-scoring New Zealand carry a single point advantage into the blockbuster showdown with the Hockeyroos. England and India are locked together on the six-point mark in pool A with the former ahead on goal difference. In basketball, Scotland beat India 96-81 to top their group while the women’s beach volleyball duo of Melissa Coutts and Lynne Beattie lost 2-0 to the hosts and now need results elsewhere to go their way to avoid elimination.